These two small Yorkies — one weighing a mere 7 pounds and the other 18 pounds even though they are full siblings — are used to this visitor. These dogs bark regularly at this coyote when they see it while they are out walking on their leashes. The coyote understands the barking and keeps a respectful distance away. In their own yard, too, on several occasions, as seen in this photo, they have barked viciously at the visitor to proclaim ownership of their turf, and the coyote, again, always gets the message by not getting too close as the owner, in this case, shoots the photo and swoops in to grabs her two tiny dogs to take them indoors. Owner Rachel never lets these two roam free and always supervises them out-of-doors. About a year ago the coyote showed up and replaced the raccoons who used to come around. What attracts the coyote to her yard? Possibly the pond, but maybe not — the water level is really low and the coyote could not reach it. In the Spring, there are persimmons in the yard, but not now. Most of the residents in this area are perfectly happy with this visitor — it adds to their enjoyment of their neighborhood, they tell me! They know there could be issues between their pets and the coyote, so they have educated themselves, and they have taken the proper precautions to keep them apart always. Yay for the community! On Thursday, February 16, 2017 the Georgia Department of Natural Resources announced a Coyote Killing Contest. http://www.georgiawildlife.com/node/4325. This coyote killing contest which is to begin in March is ill-advised and inhumane. If you agree, here’s what you can do to let your opposition be heard. Here are talking/email points that can be used. What is the reason for this inhumane contest? Removing coyotes does not reduce their population over the long term. In fact, the number of coyotes will increase as competition for resources is reduced. And, coyote populations will not increase beyond the carrying capacity of an area. So, they will not over populate, as some other species may do. To prove this point, the USDA Wildlife Services kills an estimated 70,000 coyotes each year and the number of coyotes has not diminished. Recent studies in South Carolina show that coyotes have minimal impact on deer populations (Kilgo et al., 2016). Most of their diet is rats, mice and other small rodents. Without coyotes, these prey populations would increase. Is it simply because they are not “native”? The reason that they now thrive in the southeast is that we removed wolves from this area. Each impact on a species has consequences. We often don’t recognize this impact until sometime in the future. And, what does native vs. non-native have to do with it anyway? Coyotes have been in Georgia for decades and are here to stay regardless of efforts to remove them. By killing coyotes in March, which is when pups begin to be born, these pups will be left to slowly starve to death. Would you want to watch a domestic dog’s pups slowly starve to death? Why not treat them with the same dignity? This contest also teaches people that it is ok to hold contests with the intent to kill life. In this case, there is no purpose to the contest as these dead coyotes will not be used for food, clothing, etc. Why do we want to teach people that senseless killing is ok? The mission of Georgia’s Wildlife Resources Division of the DNR is “to conserve, enhance and promote Georgia’s fish and wildlife resources and outdoor heritage through science-driven research, management, regulation and education.” This contest is not science-driven and is not conserving, enhancing and promoting wildlife resources. So, how does it support the Wildlife Resources Division’s mission? How does this contest support the Georgia Department of Natural Resources? DNR’s mission is “to sustain, enhance, protect and conserve Georgia’s natural, historic and cultural resources…that utilize sound environmental practices”. This contest is not sustaining, enhancing, protecting and promoting Georgia’s natural resources and does not utilize sound environmental practices. Killing contests do not support the GA DNR mission. Thanks for supporting wildlife through your actions and for spreading the word to friends and colleagues and asking for their participation. How Much Rain Do You Think A Coyote’s Coat Can Hold? Answer: In the winter, lots! Certainly more than your own soaked coat and jeans, and more than your 30-pound dog’s coat unless it’s got longer fur than the coyote’s. From the looks of it, I’m supposing you could water two small potted plants for a week if you could only transplant the coyote as a sprinkler to your yard! Coyote coats serve to insulate them against the elements. And the coats are fantastically camouflaged, helping them to blend into the landscape, especially during the dryer months. The coats aren’t large — they only cover scrawny, 30-pound frames, but the fur is long, reaching four-to-five inches in the winter. These coats are wonderfully crinkly and puffy, making coyotes look bigger than they actually are. Their full coats will be shed in the springtime, at which time you can often see their ribs and hip bones poking up and visible through their skin. Their new coats will begin coming in sometime during late summer. Shaking the rain off not only lightens the load — water is heavy — but it also serves to loosen some of the grime which has accumulated. Shaking also helps take care of the drip getting into their eyes. Oils and an undercoat prolong the time a coyote can stay dry in a downpour. Coyotes are usually out, rain or shine, sometimes just to survey their territories and look around. Burrowing rodents must often come to the surface to keep from drowning during heavy rains, and coyotes often take advantage of this for hunting sprees. 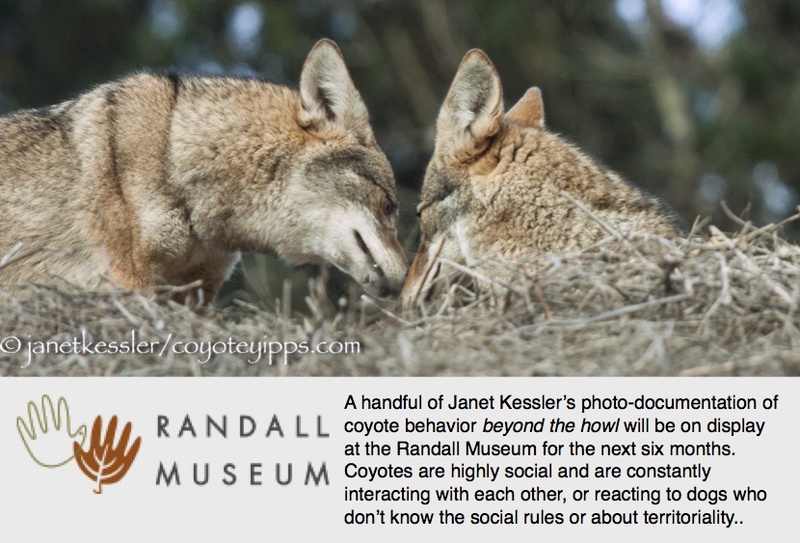 Coyotes, like we humans, go through mood swings, as can be seen by their behaviors. On this particular morning, this young coyote was in a very happy mood, and showed this by racing around wildly in circles — it was a spurt of sheer joy and energy. Then, a clod of dirt was energetically and excitedly dug up and tossed into the air. It became a toy which was chased, and jumped after any number of times. And then a plastic water-bottle was found: It cracked and crackled loudly when it was (warily and distrustingly at first) pounced on or bitten, rubbed on or stepped on. The coyote seemed to love producing the sharp sounds. When coyotes find themselves alone, they often play and entertain themselves, and often they use found objects as toys. This young coyote is one of the loners in the city who has not yet claimed a territory nor found a mate. Some of our coyotes are dispersing right now as their parents prepare for the next breeding season. Usually between the ages of 1-3, coyotes disperse: they leave their birth homes to make their own way in the world. A coyote may be forced to leave by a sibling or parents, or it may leave on its own. As they explore new areas where they have not been before, you might see one — hurrying through a neighborhood, either down a street or on the sidewalks. They stick to these passageways because coyotes, just like humans, like taking the *path of least resistance*. When they find a place with adequate natural cover, they might try it out as a place to take refuge for a while. They may live for the time-being without a territory and alone. Recently dispersed coyotes tend to live in smaller open spaces, and in-between and on the edges of other coyotes’ claimed territories, and they are not territorial. These individuals are called transients or interlopers. Transients include not only dispersed youngsters, but others who have been displaced from a family — even oldsters! Being social animals, they may get lonely and may at times seek out the company or achieve a mutual *truce* with amenable dogs although they are usually not quite willing to let down their guard totally to become friends. Please do not befriend them, and never feed them. As consummate hunters and opportunistic eaters, they are totally able to provide for themselves. Please let them do this. Instead of being friendly, give them the cold-shoulder. They will be safer and so will your pets if you keep this psychological barrier in-place. And please remember never to feed coyotes: it could lead to their death warrants. Food conditioning, which results from feeding them, causes coyotes to hang around humans, and sometimes approach and demand food. Wild animals normally defend themselves from fright, a startle, or anything else by nipping, and they will do so if provoked, even if you don’t think you are provoking them. They will, of course, continue looking for a territory which has not already been claimed by another coyote family, or one that has been vacated for a number of reasons by another family. Note that, once the carrying capacity of an area is filled, such as in San Francisco, coyotes move out of the city and south, where they have been found as far away as 60 miles within just a week or so. Dispersion is a high-risk time when more coyotes than usual are killed by cars. Please be careful when you drive. finally, she comes to a natural open space where there is natural coverage for her to hide in. San Francisco has plenty of these small havens.